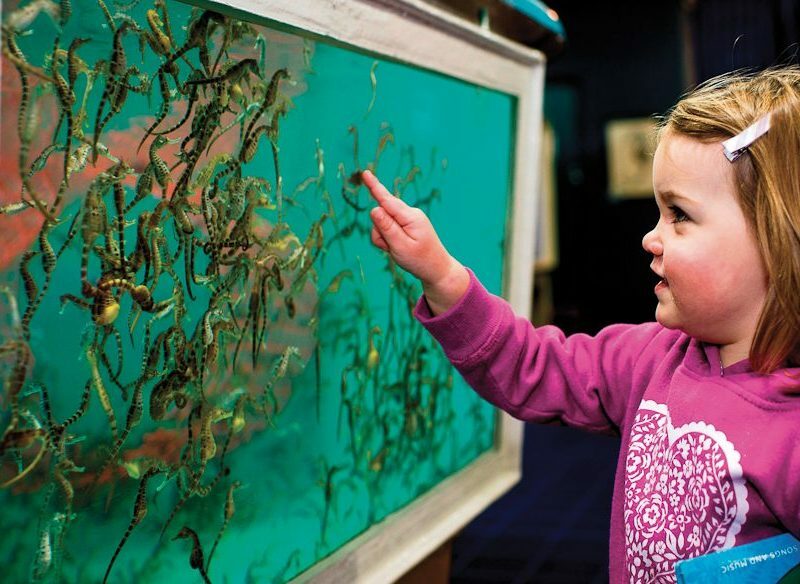 One of Seahorse World’s fascinating displays (photo: Rob Burnett). Teach your kids about the wild world the best way possible: getting up-close-and-personal with the feathery, furry and scaly kind. Your little devils can meet Tasmania’s endangered ones with Monarto’s Devilish Native Experience, which takes you into the exclusive breeding facility for one of Australia’s most troubled animals. Tassie devils at Monarto Zoo (photo: Dave Mattner). Experience feeding time for the Tasmanian devils and also learn about Monarto’s conservation efforts in saving the black-footed rock and mainland tammar wallaby, brush-tailed bettong and bilby. Prices start from $65 for non-members; ages 6+. This is a world first! ‘Wade with the Platypus’ is a fabulous encounter for kids interested in one of Australia’s mysterious egg-laying mammals. Who wouldn’t want to see a beautiful platypus? Offered at Healesville Sanctuary, children will be briefed by keepers before jumping into waders and venturing into the play pool. Here they’ll be able to pat, play and feed the platypuses in a safe environment. $199; ages 12+. Is there anything cuter than a baby seahorse? Like no other experience we’ve heard of, Seahorse World has it all, allowing kids to learn about the lifecycle of the seaweed-dwelling creatures with a glance into the seahorse farm. The Kids’ Discovery Program has your children feeding the baby seahorses and sharks, and handling hermit crabs, star fish and more. $15 per person (adults welcome); ages 4–10. Each school holidays the Creature Keeper program focuses on a different species – in April, it’s all about birds. Designed for young adults, they will gain access to behind-the-scenes areas, learn about how each enclosure is designed to house its feathery occupants, what foods they eat, watch how the keepers follow chick development within the egg, meet a wedge-tailed eagle and have their photograph taken beside one of the sanctuary’s wonderful birds. Two-day course from $135; ages 12–17. Kids can live out their ‘When I grow up’ fantasies and see the real side of zookeeping at Australia Zoo on this day-long adventure. Be a zookeeper for a day at Australia Zoo! They can spend the morning with a variety of animals such as resident Aldabra tortoises, Igloo and Goliath, as well as rhinoceros, giraffe and binturong, to name a few. Each program is unique, so be prepared to care for some unlikely creatures. $85 per person; all ages. Spiders and snakes and crocs, oh my! If your child likes creepy crawlies, then this is the program for them. Tawny owl feeding at the Australian Reptile Park. The Australian Reptile Park lets its littlest keepers see the ‘off display’ reptile room, handle lizards and snakes and observe spider-milking. They also get to meet Hugo the tortoise, play with Tassie devil babies, interact with Tawny owls and much more. $70 per child; ages 8–12. The Zooventure at Canberra’s National Zoo and Aquarium is two hours of rare animal encounters that average zoo visitors can only dream of. Prices start from $75 per child; ages 5–12.